Hopefully you'd never have to use it, but should the need arise, you'll certainly be glad to have the Leatherman Raptor ($TBA) at hand. Developed for uniformed medics, this scissor-like multi-tool features 420HC stainless steel shears, a strap cutter, a carbide glass breaker, a ring cutter, a ruler, and an oxygen tank wrench. Available May 2013. Like to carry your keys on a carabiner? Upgrade from the climbing gear to something more refined... like the Keysquare ($36). Designed specifically for carrying your keys, it's cut and machined from a solid block of stainless steel and hand finished for durability. While it sports a long slit for attaching to a belt loop, it's still small enough to easily slide into a pocket, and like any good piece of metal, it also doubles as a bottle opener. Multi-tools can sure be handy — but with most of them, you'd best have both hands available for operation. 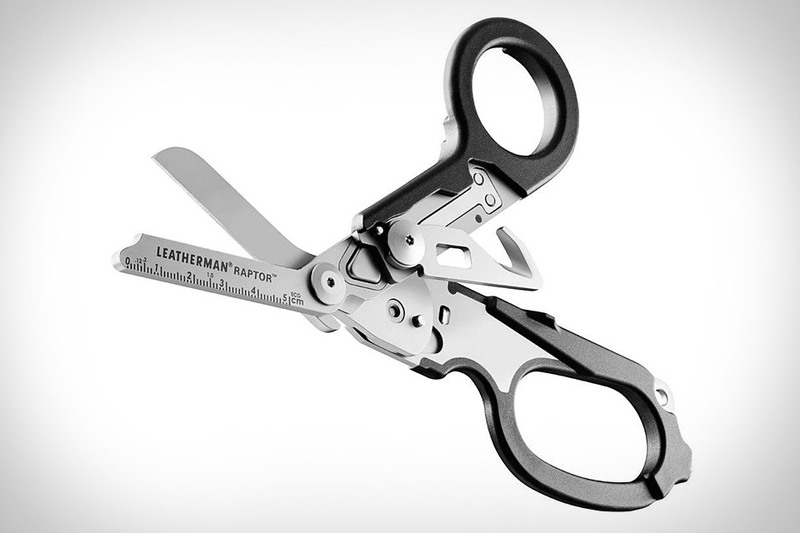 The Leatherman OHT Multi-Tool ($70) is the company's first full-size tool to be designed with one-hand operation in mind, meaning you can get to the pliers, cutters, knives, screwdrivers, saw, can and bottle openers, and wrench without taking your other hand away from the steering wheel the bad guy's throat your materials. Not satisfied with the shovel/crowbar/axe combination of the original Crovel? The Crovel Tactical ($110) should sate your multi-purpose weapon/tool hunger. Boasting a steel shovel head, the Tactical offers a saw tooth edge, a threaded hollow steel handle that lets you screw in a slingshot attachment or a deadly sharp spike, 15 feet of 500 paracord wrapped around the handle, weighting that makes it an effective throwing weapon, and, of course, a bottle opener — because who cares how many people you kill if you can't enjoy a beer afterwards. Get multiple projects done without multiple trips to the tool shed with the Crescent Odd Job Multi-Tool. This relatively petite tool serves as a hammer, mallet, ratcheting bit driver, screwdriver, utility knife, and nail puller, all while measuring less than a foot long. The real surprise? A multi-tool on Uncrate that doesn't include a bottle opener. Sure, there are more powerful drills — but few can go where this one can. The Bosch 12-Volt Max Pocket Driver sports a compact, lightweight design that allows it to fit into areas most drill's can't while making it easy to keep nearby on a belt loop or in a holster. Lithium-ion batteries ensure that it'll have the juice to finish the job and recharge quickly once it's over, and thanks to a motor that supplies up to 265 inch-pounds of torque, it's got more than enough muscle to tackle nearly any task.